Illustration by Maria Gunnes Sibbel. Click above image for higher resolution. 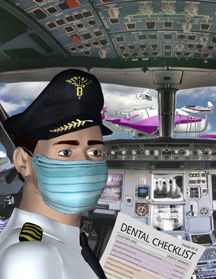 A dental professor at the University of Michigan and two pilot-dentists believe that implementing a checklist of safety procedures in dental offices similar to procedures used in airlines would drastically reduce human errors. Crew Resource Management empowers team members to actively participate to enhance safety using forward thinking strategies, said Russell Taichman, U-M dentistry professor and director of the Scholars Program in Dental Leadership. Taichman co-authored the study, “Adaptation of airline crew resource management (CRM) principles to dentistry,” which will appear in the August issue of the Journal of the American Dental Association. 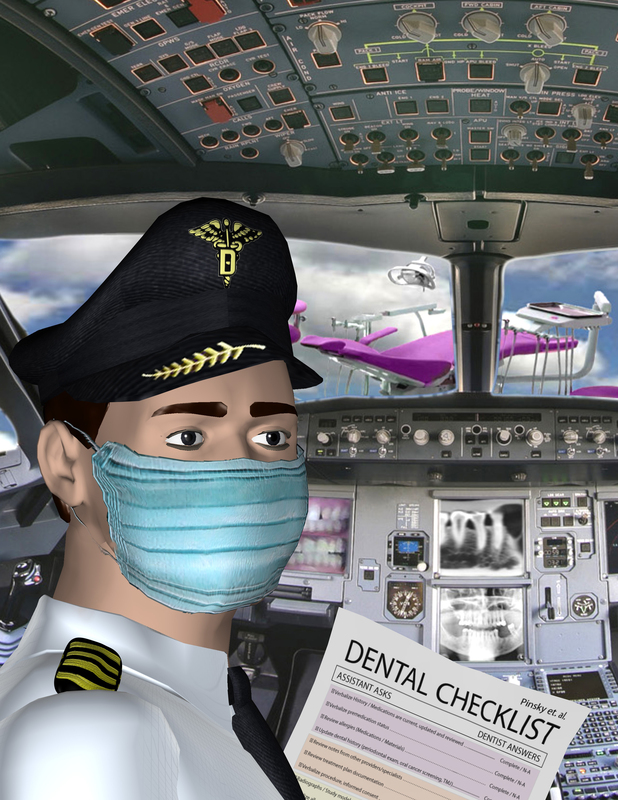 Airlines implemented CRM about 30 years ago after recognizing that most accidents resulted from human error, said co-author Harold Pinsky, a full-time airline pilot and practicing general dentist who did additional training at U-M dental school. “Using checklists makes for a safer, more standardized routine of dental surgery in my practice,” said David Sarment, a third co-author on the paper. Sarment was on the U-M dental faculty full-time before leaving for private practice. He is also a pilot and was taught to fly by Pinsky. CRM checklists in the dentist’s office represent a major culture shift that will be slow to catch on, but Pinsky thinks it’s inevitable. At each of the five stages of the dental visit, the dental team is responsible for checking safety items off a codified list before proceeding. Pinsky said that while he expects each checklist to look different for each office, the important thing is to have the standards in place. Studies show that CRM works. Six government studies of airlines using CRM suggest safety improvements as high as 46 percent. Another study involving six large corporate and military entities showed accidents decreased between 36-81 percent after implementing CRM. In surgical settings, use of checklists has reduced complications and deaths by 36 percent. Many other industries: hospitals; emergency rooms; and nuclear plants look to the airline industry to help craft CRM programs, but dentistry hasn’t adopted CRM, said Pinsky. For the next step, the co-authors hope to design a small clinical trial in the dental school to test CRM, Taichman said.